I’ll be in Santiago overnight next Tuesday. US$117 for a visa to pass through is steep. Looking for recommendations from those who have been to England. We want to see London and visit the midlands (for family). What else is a good place to visit? Looking at 7-8 days. London can be hideously expensive, esp. accommodation. Have a look at the Premier Inn chain. Not a lot of character, but they have some reasonably priced hotels in prime locations. E.g. a few years ago we stayed in their London County Hall hotel, next to the London Eye over Westminster Bridge from the Houses of Parliament. Iconic. And it appears in every second movie located in London. They also have a hotel in Borough Market near the Tower which would be a good spot. Otherwise, I agree Bloomsbury is a decent base and the nearby British Museum unmissable. 7-8 days will fly by. Where in the midlands? Discover the London County Hall Hotel today in London from Premier Inn, The UK?s top-rated hotel chain. Book today for the best prices. For what it is worth, Chile is a fantastic place to visit. Going with family we have 3 boys 9-14. We enjoy any place we go really, love seeing attractions and surrounds. We spent a day here when we were in England in 2006, our son was 14. We had a good time, I didn’t do any of the hair raising rides, but there are other rides which are more sedate. Agree with @Gwilty re York. Went there by train July 2018 and spent the day was good. I’m thinking @The_Chilean_Bomber knows a thing or two about Chile. Family were from Wolverhampton but live in Shrewsbury these days. Probably heading to Berlin after uk, does it make any difference flying out of Manchester vs London? Would save travelling back south. May not get a choice of either if flying Ryanair. And stay in the old east Berlin. Much more character. Bring US dollars to pay for it. A lot of cards don’t seem to work over here. Also, there is a 200,000 pesos ATM transaction limit per day here. About AUS$400. First time back since 1995. It’s a lot cleaner these days and the country is slowly progressing. If you want to go to the soccer you must buy tickets over the internet. No ticket sales at gate. Absolute bargain if anyone is looking at going to China. But this is a great opportunity for people to get a state-sponsored tour of China. See China for yourself instead of what the MSM wants you to see. Thank fark I’m not on the 5am wake up for the Everest-viewing flight… I’m more farked up than Fark Carlton. P.P.S. It took me a loooong time to type this, hopefully it’s now error-free. Fark Carlton. The tour isn’t for me but for people who haven’t been there before or wary of travelling there it gets their foot in the door. 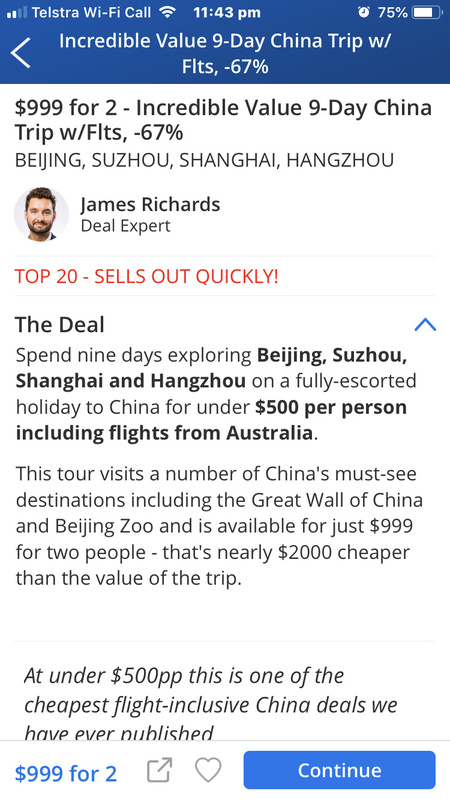 I would love to see stats on how many people return to China to tour independently after doing one of these cheap tours. I would guess it’s pretty high. For people on a budget $999 for 2 people with a tour, 7 nights accommodation, return flights plus 1 internal flight is amazing. Return flights alone are in the $400-600pp region normally. Yes I know. When I wrote “you” I was not referring to you, Aceman, but to the generic reader. Are those tours like the zero baht tours the chinese take to Thailand, where the tour itself is cheap but then they are taken to all pre-arranged overpriced stores/attractions and pressured to purchase.